Girls love to do their makeup with some quality products. In this hamper, we are providing you with some essential makeup items that a woman needs at home. 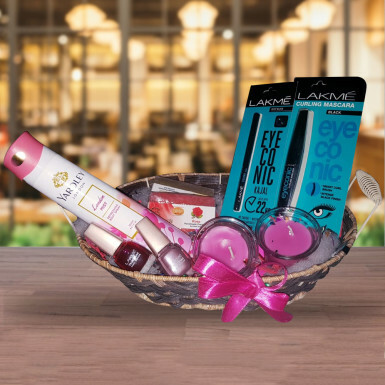 This basket contains some quality products like soap, nail paint, talcum powder, kajal, and mascara. A pair of scented candles makes this basket perfect to express your romantic feelings to your lady love. It will be a unique hamper to make your partner feel special on her birthday and anniversary.